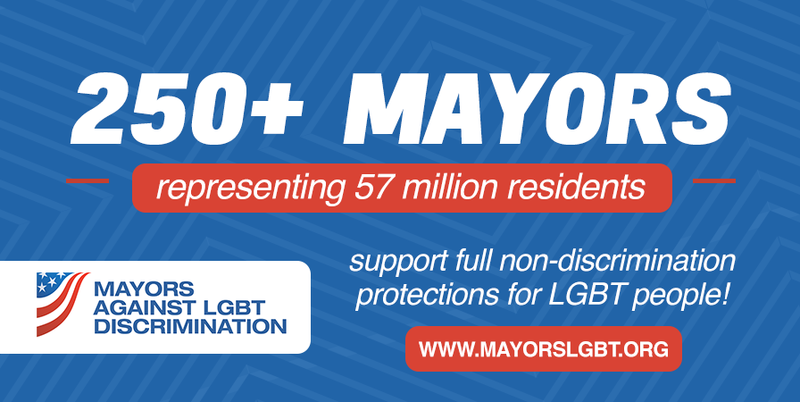 Mayors Against LGBT Discrimination, a broad-based nonpartisan coalition of local elected officials around the country, has reached more than 250 members who have pledged their support for LGBT nondiscrimination protections. In total, 257 mayors from 47 states and the District of Columbia are part of the program, led by the national organization Freedom for All Americans. The mayors hail from cities large and small and represent in total more than 57 million constituents. In recent weeks, new mayors include Lawrence Keller of New Hope, Pennsylvania, a Republican representing a small town of only 2,500 people; John Mulfield of Whitefish, Montana, who represents constituents living in a state with zero explicit protections for LGBT people in any area of life; Mike Purzycki of Wilmington, Delaware, the first Delaware mayor to join the coalition; and Catherine Pugh of Baltimore, Maryland, who is kicking off her city’s Pride events at the end of next week. Mayors Against LGBT Discrimination launched in January at the U.S. Conference of Mayors in Washington, DC, and will convene at the next conference in Miami Beach at the end of this month. In past months, mayors in the coalition have spoken at in-person briefings and hosted online panels about equality, spoken out in the media about their personal stories of support, and issued public statements against discriminatory legislation and rollbacks to LGBT rights. Last week, Mayor Marty Walsh of Boston predicted that a 2018 ballot initiative to roll back existing protections for transgender people in places in Massachusetts would fail, stating “Boston is a fully inclusive city and Massachusetts, we’re a fully inclusive state.” In Washington state, where opponents of transgender equality are similarly attempting to repeal a decade-long transgender-inclusive nondiscrimination law at the ballot, five new mayors have joined the coalition in the past month, bringing the total to 12 across the state. To learn more and to view a full list of mayors participating in each state, visit www.mayorslgbt.org.